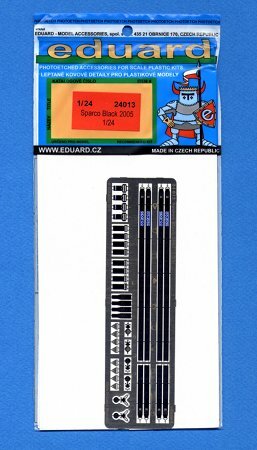 This new set from Eduard (item number 24013) consists of a pair of circa 2005 black Sparco 5-point competition seatbelts. These belts are suitable for any "Tuner" car, sports car, rallye car or general race car of the period. Thanks to the large size of the individual components of each seatbelt they will be easy to assemble. If you follow Eduard's clear instructions you will be pleased with the results. The belts are very finely detailed and accurate. They will add an indispensable bit of accuracy to your next automotive racing project. This set of seatbelts is highly recommended, and I would like to thank Eduard for the review sample.